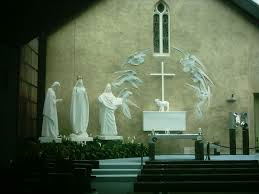 The National Eucharistic Congress will take place at Knock Shrine, Co Mayo on Saturday, 26 and Sunday, 27 September 2015. The theme for the Congress is “Christ, our Hope” “Críost ár ndóchas” (Col 1:27). This theme will be reflected in all homilies and presentations given at the Congress. The National Eucharistic Congress, which is free of charge, will have a particular focus on Marriage and the Family as well as the Year of Consecrated Life and the upcoming Jubilee of Mercy. Posted on August 28, 2015, in Uncategorized. Bookmark the permalink. Comments Off on National Eucharistic Congress, Knock 26-27 September 2015.